The beauty of a genre is the many, many branches it can fracture into. 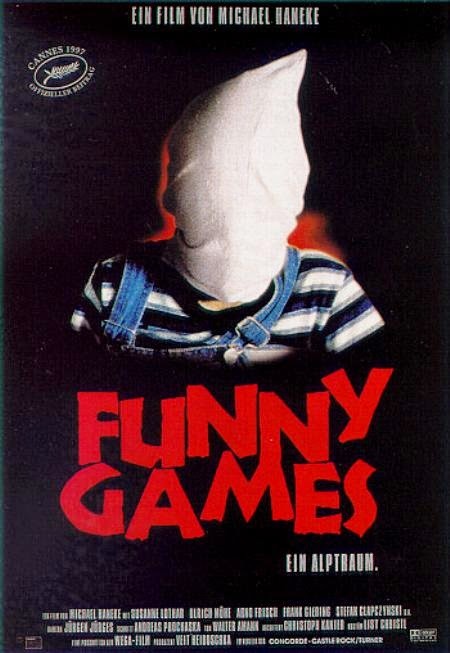 At its highest level, Funny Games may have elements that make it a horror movie. When you begin drilling down and looking more granularly at the movie, it's really somewhat of a thriller and absolutely part of a sub-genre I'm just calling "violence" or "violent film." That may sound hugely nebulous and as though many movies could fit into it but, the differentiator of movies that fit into the "violent movies" category is that their violent components are for the sake of violence. We're not talking about ancillary explosions in the course of a daring escape here, we're talking about deliberate, violent actions with no purpose other than "being violent." My editor says, "The word that comes to mind here is gratuitous." She's not wrong. The violent movies genre is literally defined by excess. So what makes the movie scary? I've never believed that Funny Games is about "being scary" - I've always felt it's entirely about discomfort; an emotional punch in the gut that is meant to "wake us" from our robotic consumption of media and linger with us, long after the movie ends. This read is supported by writer/director (Michael Haneke) saying he wasn’t making a horror movie, he was putting together a commentary on violence in media. At every turn, Funny Games challenges our expectations and throws us jarring curveballs to keep us guessing: from the pounding, clanging, screaming, metal music slapped over the pastoral family scene in the opening credits, to Peter and Paul’s (our killers) abrupt switch from "friendly guys next door" to dispassionate killers, we are constantly wrestling with how to understand the message and motivation of the movie. With so may genre elements turned on their heads, we don't know what to trust or what to believe; the killers even tell us, “Don’t trust what you see.” Are the things we're seeing on the screen really happening or will we get some kind of relief when one of our protagonists wakes up from this horrible dream and tells us, "it wasn't real." Peter and Paul tell us that they are going to kill the whole family, but we’ve heard that before. We’re tainted by our experiences. We assume that the family will escape in the end because that’s how movies work. This genre-based assumption sets us up to be surprised, unnerved, and uncomfortable when the family is actually killed. We also hold sacred the idea that children will not be killed in a movie and here, again, Funny Games goes against our expectations - and knows it. Paul even makes reference to this idea and laughs at us (the audience) for believing such a thing. Paul is such the instigator, continually trying to make us participate in the violence - then makes fun of us for our genre-based misconceptions and expectations. He wants us to become accomplices but doesn't actually seem to care about "having us on his side." He's simply looking for another reason to get under our skin. Anna tells Peter and Paul, “I don’t know what game you’re playing but I’m not going to join in.” She’s frustrated because she doesn’t understand their motive, or lack thereof. Here she speaks for the audience. We need our killers to be killing for a reason so we can label them as different from ourselves. To distance ourselves from their behavior. To believe we are better than them. To understand how to keep ourselves safe from others like them. Their motive seems to be violence for the sake of violence. When asked, “Why are you doing this?” they respond, “Why not?” It's not simply this pointless violence that makes us uncomfortable, it is their lackluster execution that we find chilling. There is no passion in their actions; They don't even seem to be taking joy in their violence. We must grapple with how two young, apparently affluent, young men could become such monsters. We are also subjected to long, quiet, “real-time” scenes that are excruciatingly slow and make us uncomfortable because they do not allow for any escape from the violence; we have to live every painful second along with the family. These moments are almost meditative in their own way - giving us time to really steep in Anna's soft, endless crying. These scenes are emotionally complex and trying; how long can we, compassionate humans, be expected to sit by and helplessly watch this family suffer? How long can we listen to Anna cry before we should run for help? Without directly asking, the movie makes us ask ourselves, "How many times have we looked the other way when someone needed our help?" This is our punishment; we must suffer this humiliation and abuse with Anna and her family for every time we've chosen not to help someone in real life. If you're not feeling drained from just reading this post, it's time for you to track down Funny Games and prepare yourself for a beating.